From the moment I put pencil to paper, I decided that this project would focus on minimalism throughout the construction process. As with the entire project, my main focus was (1) Reduce, (2) Reuse, (3) Recycle. 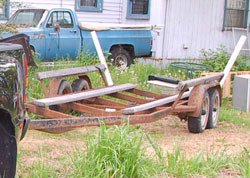 I started off with a very inexpensive trailer which was clearly on it's last legs. This trailer would have been destined for the scrap yard in another few months given the state of rust. I had originally bought it only for the axles which would have cost more than I spent on the whole frame. But after some discussion with more experienced people, I decided to revive the chasis. 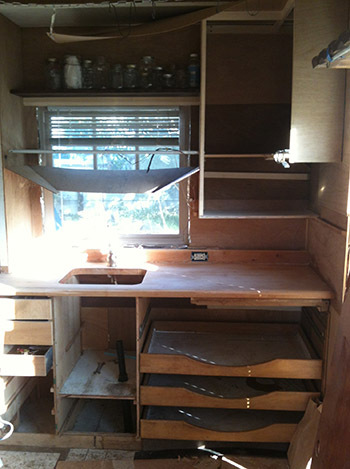 The first chore was to transform an old and rusty boat trailer into a functional chasis for the tiny house. 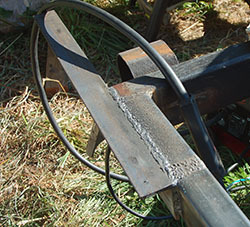 I spent several days with my angle grinder cutting off un-needed elements and then wire brushing the rust. When this was finished, I was left with a nicer looking, but still structurally weak frame. Thankfully I became acquainted with a contractor who knew enough about structures to point me in the right direction. 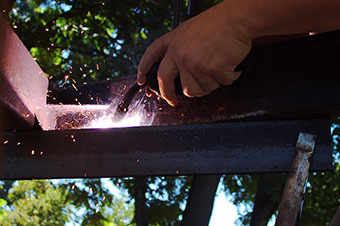 We bought several pieces of structural steel to rebuild the weak sections of the trailer and welded them in place. 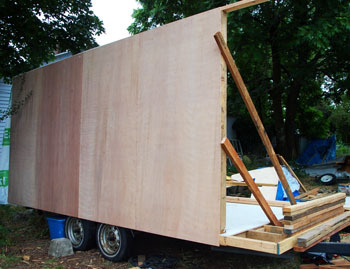 By the time we were finished, the trailer was noticeably heavier but also much stronger. We added reinforcing struts to the front and a new piece of bar steel to the back in order to accommodate the flatter floor structure. I spent weeks travelling through industrial areas looking for the larger pallets which would provide long enough pieces of lumber for the frame. Yes there was a Home Despot only one mile away, but buying from there would have meant supporting deforestation. I found a number of places that discarded 12ft long pallets (this was the only common size which would give me the 8ft lengths needed). I recovered roughly 3-4 regular pallets, and 3 heavier pallets made with 4x4 timber. In addition I found huge amounts of random 2x4 lumber, much of it from 50 year old houses. This caused some trouble later on, but the strength of aged wood far exceeds that of fresh milled pieces. Once this was finished, I laid down some thin plywood along the bottom of the 'V.' The floor structure was bolted to the frame using the same steel brackets which had been built into the original trailer at the rear. Nothing usable here was wasted. b) building the framing around a cavity where the chest freezer would sit. 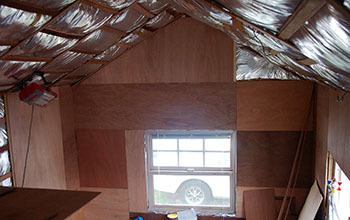 Once the floor structure was finished, we insulated it with standard R-21 batt insulation. I made the decision to run the bottom of the floor along the 'V' created by the boat trailer and so the outside edges have 3 1/2" of insulation while the middle has 8". 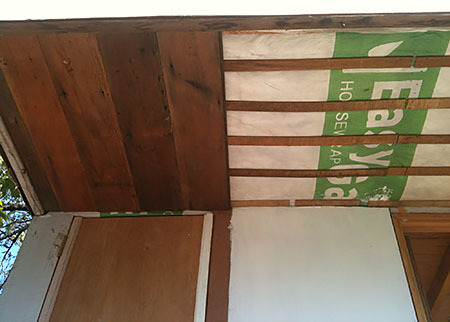 We laid regular plastic down on the inside of the insulation cavity along with carefully taping the seems in the plywood to prevent air infiltration, and then on top of the floor structure we laid down building wrap. 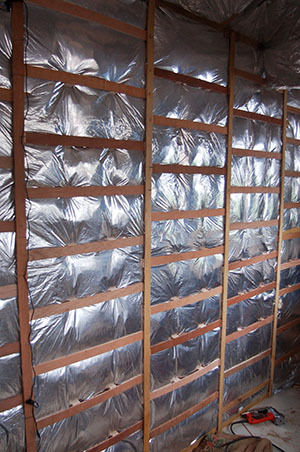 This protects the floor insulation from moisture but still allows moisture to escape if it builds up because building wrap is a one-way barrier. Here you can see the finished floor with the openings for wheels and freezer. Right now the trailer is on supports and so the wheels do not take up interior space. But when the trailer has to travel then the trailer will settle onto the wheels and they will sit above the floor. In the front you can see a 30 inch covered deck which is why there is no insulation shown there. Building house walls is more challenging then it looks to the uninitiated. Since a single wall can't obviously stand up by itself, each wall needs a triangular brace to keep it vertical until the other walls are in place to hold it together. Additionally, with the limited workspace here, we had to start with the long wall as it was the same height as the floor was wide. Once it was in place, the east and west walls could be built against it. One thing that's unusual here is that the finished plywood siding is already in place. 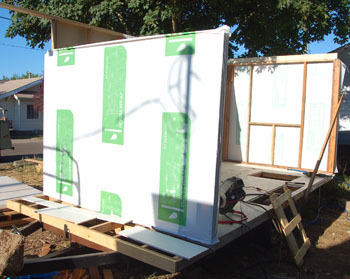 With standard construction, a rough plywood is installed and the building wrap put outside of that. 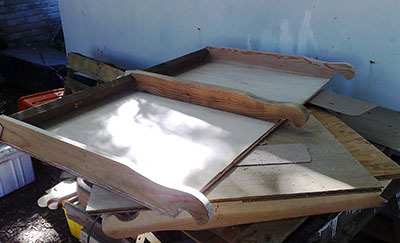 However plywood and siding would have become quite heavy. So I used the finished material as 'sheathing' for the house. 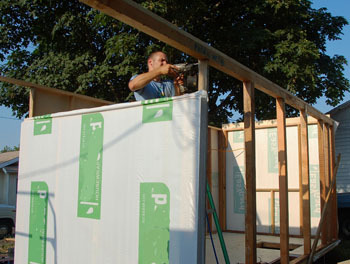 In this photo you see the three walls built up with the building wrap attached. Towards the rear you can still see the diagonal brace which is needed until the south wall is finished. You may notice that the front wall is shorter, and that's because there will be a bed loft above this which is slightly lower than the wall height. With the 'cold' walls up, it was time to build the passive-solar south wall. This wall would be built in a 'timber frame' fashion because nearly the entire wall is glass. Now the pallets which were made with 4x4 lumber come into play. 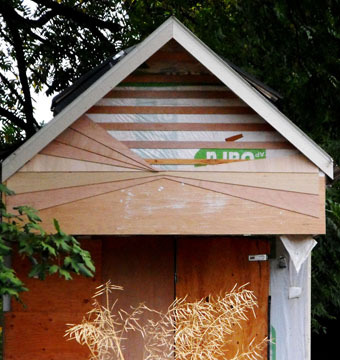 Thanks to North American largess, I was able to build an entire structure from unbought waste material (not including the plywood siding). 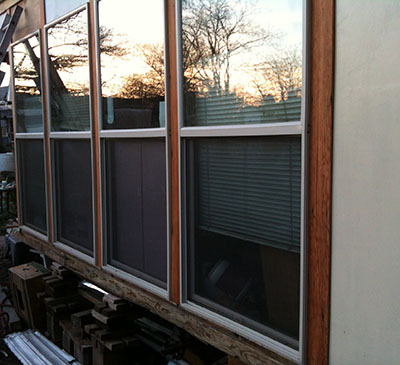 Though not totally used, we found an great deal on windows in new condition at The Rebuilding Center (love that place). 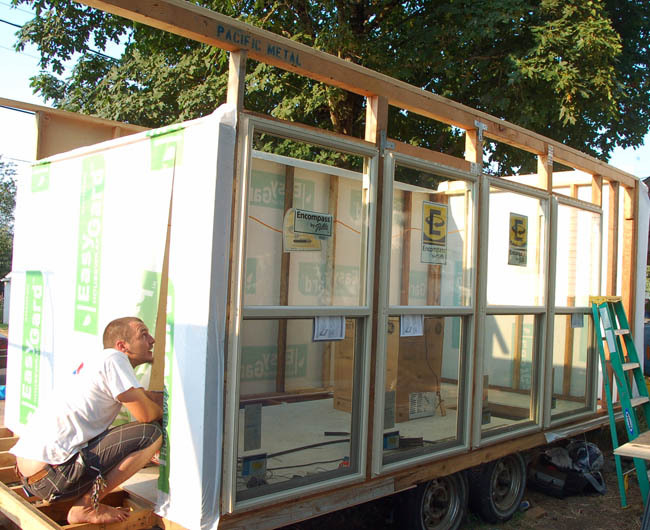 We ended up with four windows 3ft by 6ft which would provide an enormous amount of light. 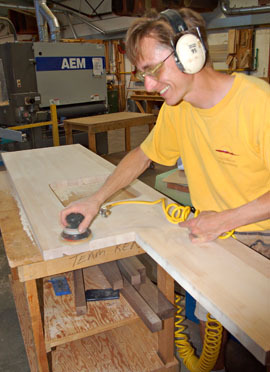 In this picture, David is using a palm nailer to put the final nails in place to avoid the risk of hammering near the glass. Here you can see the first floor is completely framed and the door opening is being cut. It's finally starting to look like a building now. 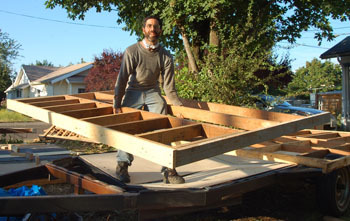 The bed loft was framed with the lumber running perpendicular to the wall because this would allow the 2x4s to cantilever the weight of the loft to the inside of the structure. For those unfamiliar with engineering, the simple diagram shows the weight of people and walls as triangles pushing down. The upward force at the other end was countered by a 2x6 beam. The first step was to install the 2x6 beam recovered from a demolition project. It took just a little sanding to bring out the historic beauty of the wood. 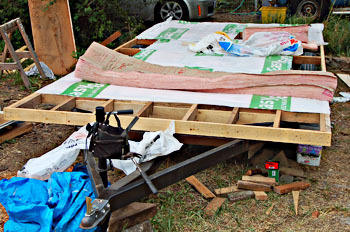 Once that was in place, we connected the floor framing with dowels and joist hangers. 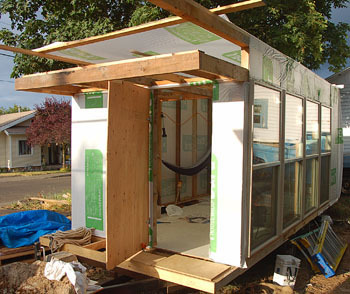 Here you see the four lower walls are covered with building wrap and the bed loft is framed. The next steps will be finishing the outer walls, and building the roof. 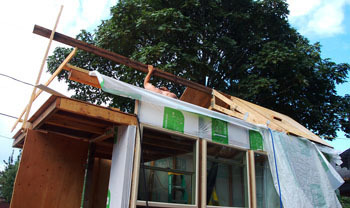 Until that gets complete, we attached building wrap over the top to keep the inside structure dry. Once we found the right sized window for the kitchen we were able to cut out and frame the opening for it. 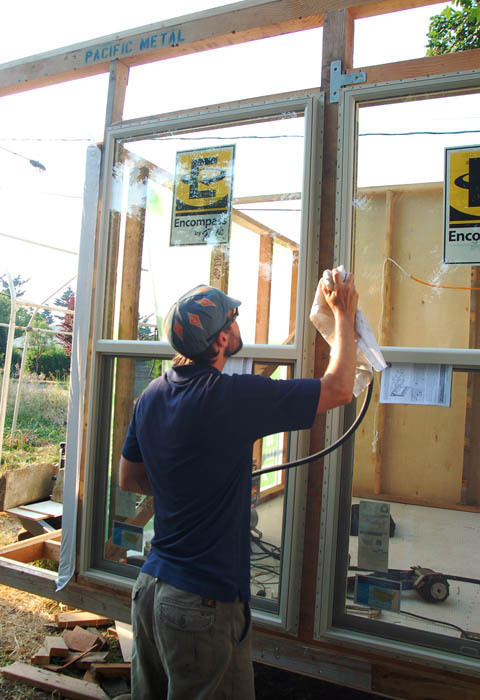 The first step in putting the window wrap is to install a material called 'Protecto-Wrap' which is a highly sticky membrane to hold the window in place and keep out drafts. The material is installed across the entire wall with overlaps on both sides and this is done all around the opening. 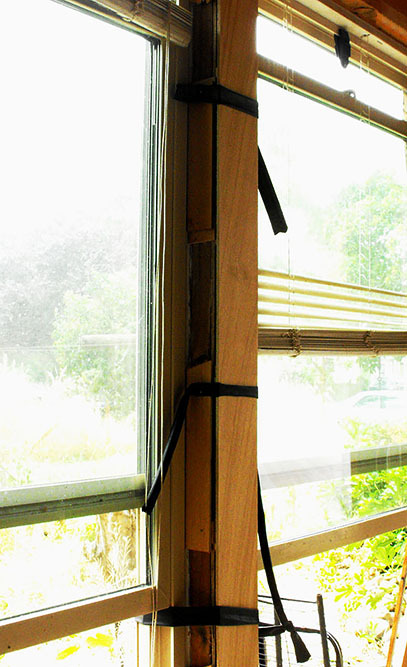 This step is only necessary with windows that don't have the standard nailing flange such as can happen with used window units. 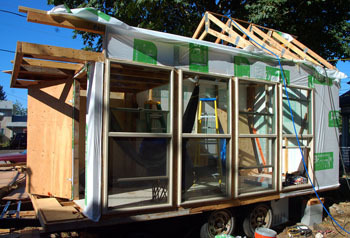 Once the stickum was in place and the window installed, this is how it looks with the finish plywood exterior and roof. After spending some time in the house, I found that I didn't enjoy being without a view to the north. So I elected to cut a small window in place. 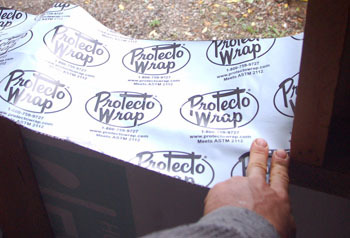 As with the kitchen window, I carefully wrapped the edge with protecto-wrap to keep moisture out. I found out, to my chagrin, that in our western culture it's much more expensive to buy a small window then a large one. 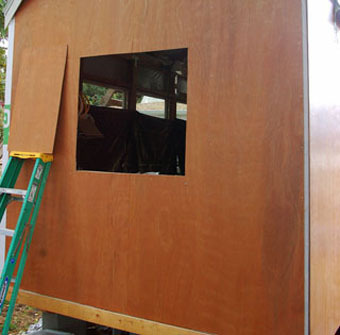 This meant that any window small enough to fit into the available space would be cost prohibitive. So I found an innovative solution in building the window partly into the wall. This kept the exposed window area small, left enough room for shelving, and allowed me to have a cheap window. By the time I was finished, the window looked just fine. 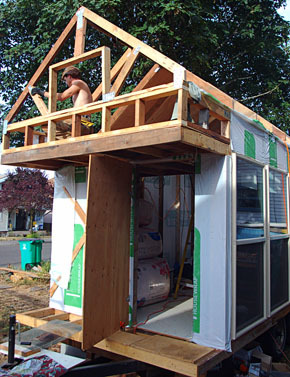 The roof was designed as a gable with a steep enough pitch to provide at least 3 1/2 feet of room in the center of the bed loft while also meeting the wall as close as possible to the height of the loft. This way the triangle created would resist the outward force of the roof against the walls. However on the east side of the house, there was no loft, and thus nothing to resist that outward force. Tie rods would have reduced the openness of the space. But thankfully the builder offered a creative solution. That solution was to use trusses. The trusses allowed the lower part to act as a brace to prevent the upper wood members from pushing outward. The frames, as they came out, ended up being very strong and effective. Here you see the trusses fully installed. From here on, the roof will be built with normal rafters in order to provide as much interior height as possible. 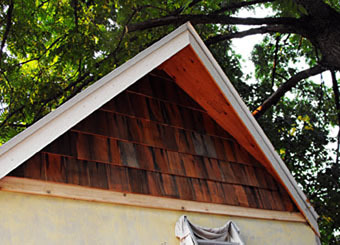 The first step to this second part of the roof was to connect the ridge board. 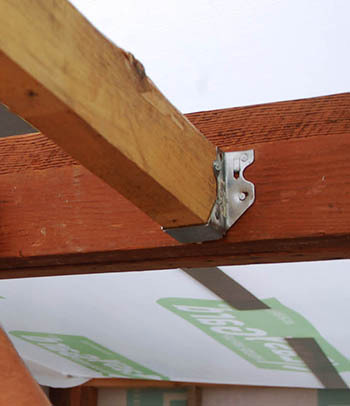 It's very important that a ridge board be continuous from end to end (the beam didn't need to continue through the trusses because of their inherent strength). For this project the only 14ft piece that I recovered was a piece with several splits in it. Therefore we nailed 1x4 bracing on either side of the beam to form what's called a compound beam. 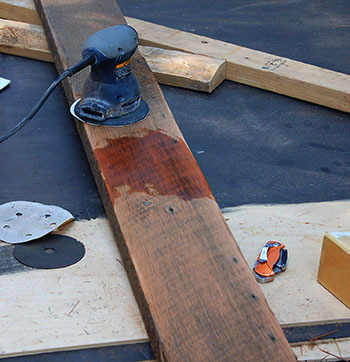 The interesting point about using reclaimed material for the rafters is that these pieces were 2" x 4 1/4" instead of the more common 2x4 or 2x6 (which are 1.5"x3.5" and 1.5"x5.5" respectively). 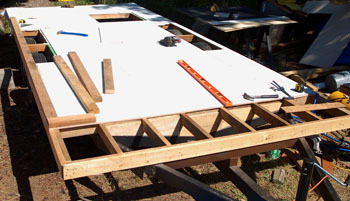 For the kind of forces we were looking at, a standard 2x4 would have been too weak, and there were not enough 2x6 pieces to complete the roof. 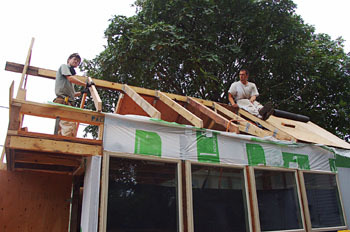 Once the roof was complete, we framed the west wall above the bed loft. The opening shown allows for the option of an upstairs window, which I didn't choose to install. 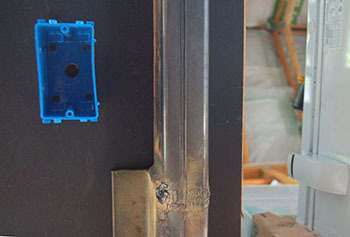 It should be mentioned that we made liberal use of steel brackets and plates to provide a stronger connection. I had discussions with several people about how to roof this structure. I was interested in either recycling the aluminum from another project, or using leftovers from a larger steel roof project. 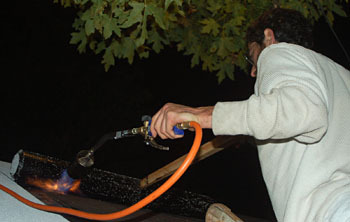 However all of people I spoke to encouraged me to use a torch down roof because a) it's the lightest material available b) it's the least expensive c) because the material is melted directly to the plywood, it wont peel when travelling on the road. Without a practical rebuttal, I grudgingly installed this petroleum product on my roof. This flashing is a long story. 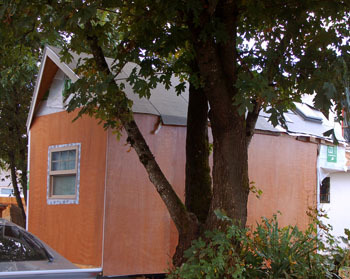 In order to include overhangs to keep the water away from the walls, they would have to be removable when the trailer was on the road. The suggestion that I followed was to build flashing in a 'V.' The wings would have a matching piece of flashing which slides into the gap created by the V (I later regretted this decision). In order to help prevent water from slipping underneath the flashing if the roof failed, I caulked the joint and then added tape on top of the joint. One of the reasons that I was so reluctant to use this material is because it requires the roof to be heated to several hundred degrees in order to bond the roofing to the plywood. This was by far the most unpleasant job of the entire project (partly because of my decision to have a 40° roof slope). 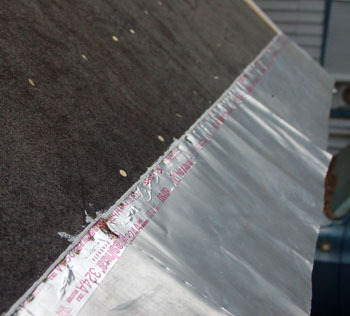 This is what the roof looks like when the material is completely adhered. It doesn't look completely smooth, but at lest I had the confidence that no moisture would make it through the roof. While I worked on the removable awning sections, I installed a few pieces of aluminum along the edges to keep water away from the walls. Before the roofing was installed, the skylights (and roofing around them) had to be finished. This way the main roofing sheets could be built over the top of the skylight flashing. Here the opening is being cut to match the units. We found two skylights at a very worthwhile price. 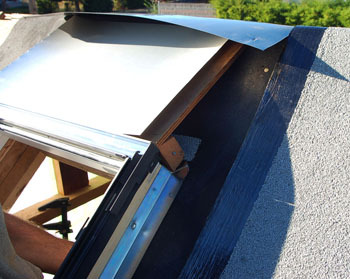 The reason that I spent extra money on skylights is because they help create a stack effect to cool the house on hot days (see thermal efficiency). Once the opening is cut, I installed several pieces of overlapping lumber to provide a rigid frame. This frame had to be the same thickness as the roof rafters so that the interior panelling would meet up properly with the skylight. On the outside as well, a box called a 'curb' was built to keep the skylight from interfering with the roof material and leaking. 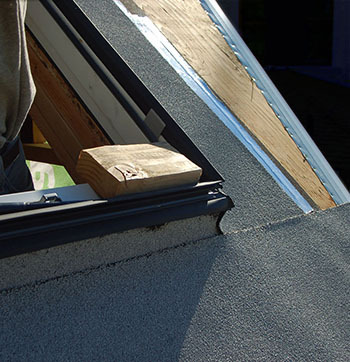 One of the reasons that skylights are prone to leak, is because of poor attention to detail. One of these details is keeping water from backing up at the top of the skylight where the roof pitch meets the vertical wall of the curb. Most contractors solve this by building up a V slope called a 'cricket' to each side of the unit. To simplify things, we just built up a single slope that flows to the skylight's drain channels. 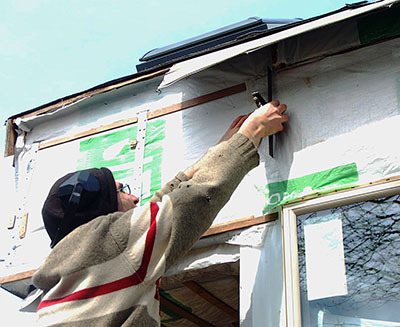 The next step in keeping out water is to shingle the flashing along each side of the unit. 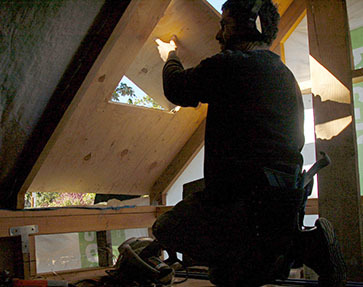 An easier way for sure is to buy the flashing units that are available for skylights. These units however are not customizable and by building a curved transition we create an air pocket around the skylight. 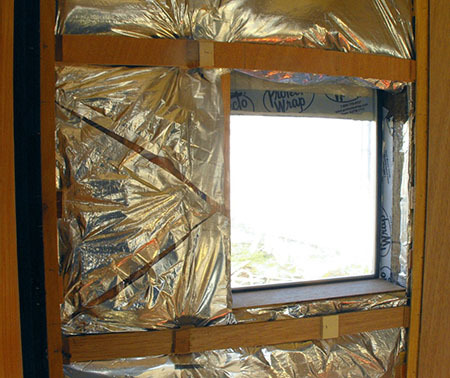 This acts as extra insulation which compensates for the large heat loss endemic in all skylight units. 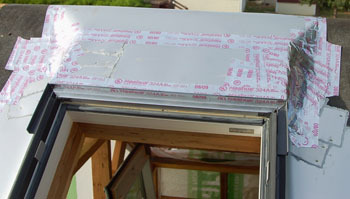 On top of the flashing, we installed high-temperature aluminium tape. 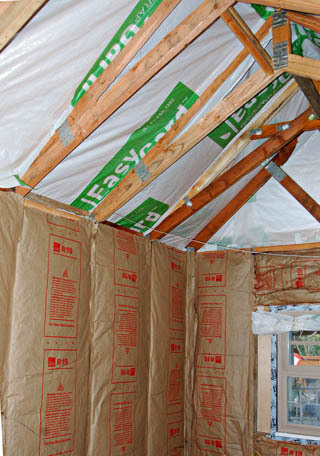 Including the roof itself, this provides three levels of protection to ensure that water doesn't get in. 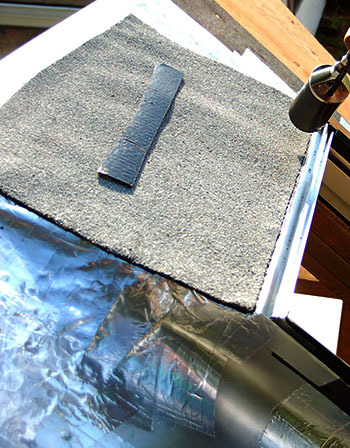 I used the more expensive high-temperature tape because of the torch-down roofing. If you use another material, than you can use cheaper tape. Here you can see the aluminium tape wrapped around the bottom of the unit. This tape acts in the same way as the protecto-wrap, sticking to the layer below to create a seal that conforms with the curves and angles. Here smaller pieces of the torch-down roofing are being installed round the skylight. 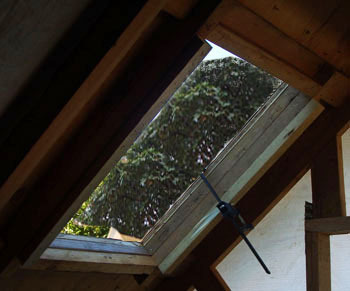 Here you can see a detail of the finished skylight with the roofing installed all around. As an architect, it was important for me to create not only a functional structure, but one with style too. Despite some limitations, I managed to do some work trade in exchange for access to a band saw and cut over a dozen of these rafter tails. Once these were finished, I built them into a series of removable overhangs. 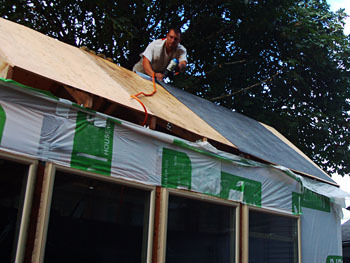 Once the extensions were connected to the plywood, I attached building paper and flashing which was intended to fit into the 'V' along each side of the roof. 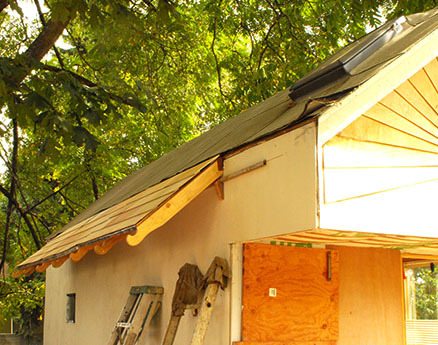 The next step was to add some shingled plywood in order to give it a nicer look. Once in place, the pieces looked quite nice. Note: The wiring shown here is a code-legal method. 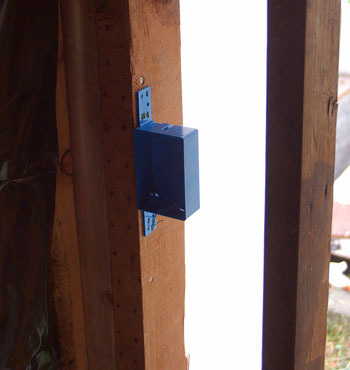 Code legal wiring is designed to withstand the high energy demands of a western lifestyle. As a minimalist I had no expectation of needing so much energy, but I got an offer that I couldn't refuse. If you live minimally, with conscious use of the power you consume, then a less robust system would function just fine. Most houses use full depth boxes which provide plenty of room for wires and outlets. However because these walls were the minimum 4in thick, the outlet boxes would leave no room for insulation. 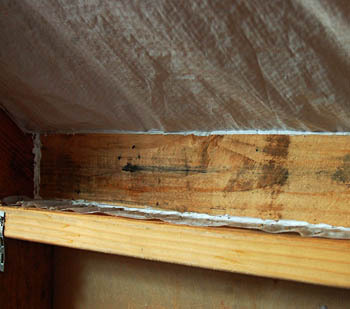 To prevent this, we used slender boxes which allowed room for insulation behind them. The downside to these boxes is that running code-legal 14g wiring into them is enormously challenging. Here you see the wiring being installed. Wiring isn't that tough to do, but it's important to keep the wire route as short and straight as possible because unlike extension cords (which are made of strands of copper) house wiring is made of three solid copper wires. This means that if it twists or bends too much in one place it can suffer metal fatigue. 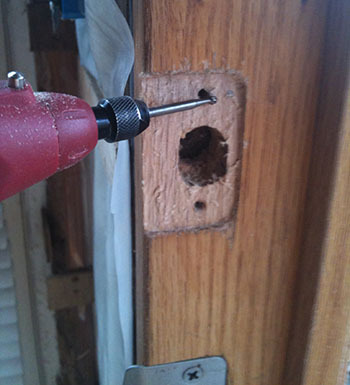 Wiring is fed through holes in the wall (5/8" for a single strand) which are drilled through the inside 1/3 of each stud. 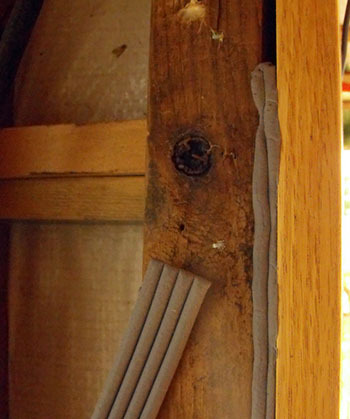 The wiring is stapled against the stud to keep it from getting twisted or tangled in the insulation. 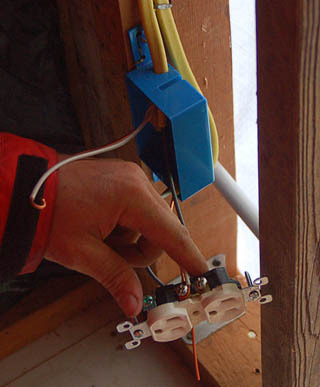 Here you can see the process for installing electrical outlets. There are several points to keep in mind and it all must be done right or you could end up with a short. First of all, you must run enough wiring to reach the outlet. It's safer to waste a coule of inches of wiring then to find yourself stretching the copper. When you have the wiring in place you take a very sharp utility knife and cut the wire down the middle (between the positive and negative wires). With the outer sheath removed you take a wire strippers and remove about 1" of insulation (there's a guide on the back of most outlets). Form the copper end into a loop and wrap it around the attachment screw (be sure it's wrapped in the same direction that the screw will tighten). Do this to both the positive (black) and negative (white) wires. Once this is done, connect the ground wire to the ground screw if the wire is being terminated. If another set if wiring is going to continue on, then the two ground wires must be threaded through a copper crimp and clamped together. Once this is all complete, then cut off the excess and screw the outlet into the box. 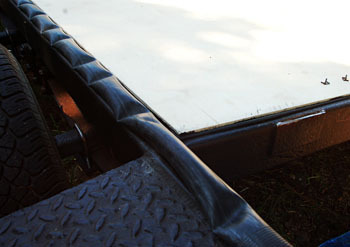 This picture was taken from underneath the trailer and shows the electrical box for the chest freezer. You can also see the welded steel frame of the trailer beneath the kitchen. Now that the box is installed, wiring will be pushed through a hole in the floor and the outlet will be installed. 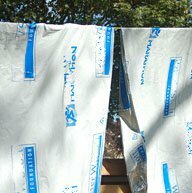 The first step in weatherproofing is the building wrap which keeps wind-driven cold from getting in. It's important to remember that even with plenty of insulation, wind can still push cold air into the structure if it's not sealed. This is the reason for using building wrap and why it's important to not overlook any gaps. 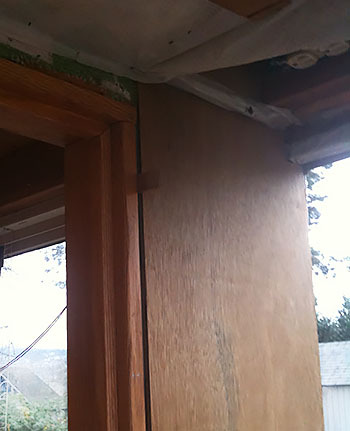 Before the insulation was fully installed, I looked carefully over the structure and used liberal amounts of caulking at any gaps which the building wrap didn't cover. 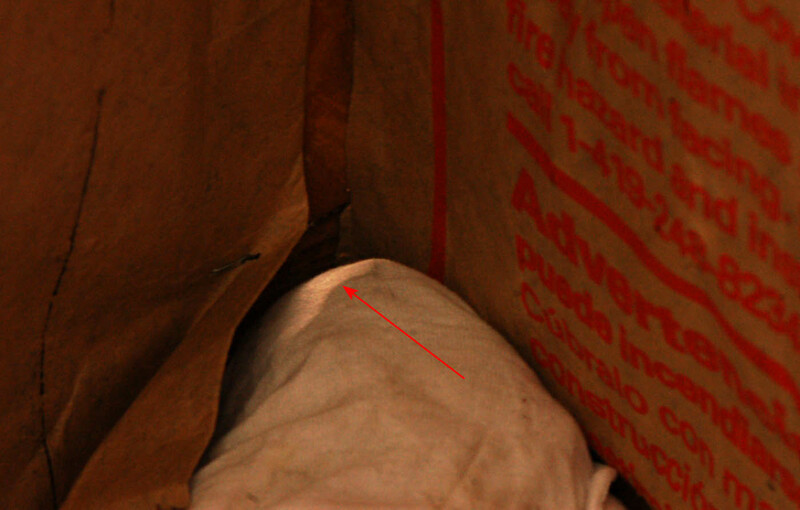 Air can find it's way in the tiny gaps between framing and next to windows which is a common infiltration point. 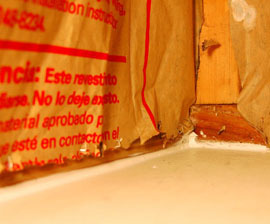 Here you see beads of caulk applied at the corner between the floor and the wall and around the roof blocking. An interesting sight presented itself one morning while I was working on the interior of the building. I spotted this tiny shaft of light peaking through along the floor. I asked myself how could light pass through if the wall was fully sealed? It took several minutes of searching before I found the gap. It was quite lucky that I happened to be working inside just at the time of day and year that the sun shone through that tiny spot. Here you can see the mistake. The building wrap didn't extend below the floor. This left a small gap right at the floor where air could leak through. A little caulk and some building wrap tape solved the problem. 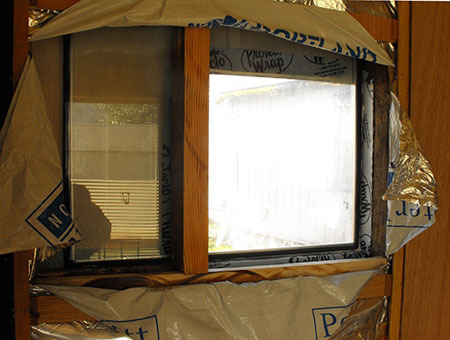 The single area where I see the largest amount of air leakage is around windows. 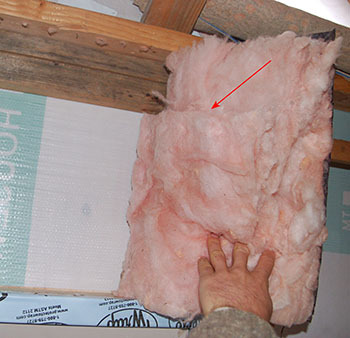 Contractors will often put insulation in the stud wall and completely ignore the spaces surrounding wall openings. The last house which I lived in (a 12 year old building) had gaps larger then 1/2" in these spaces. 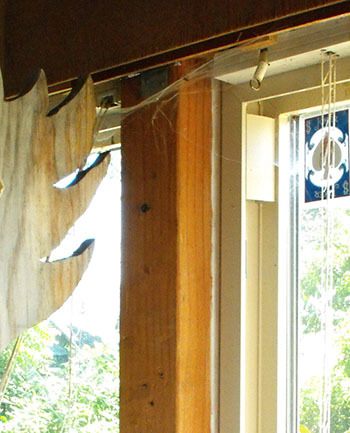 Here I recycled a piece of old styrofoam to fill the gap under the window and caulked the edges. Sometimes a gap is too large to easily fill with caulking (and we don't want to waste large amounts of it). Typically contractors use a material called 'backer rod' which is made of styrofoam and can't easily broken down at the end of it's life. To save money and waste, I used old bicycle tubes to fill the gap and caulked over top. 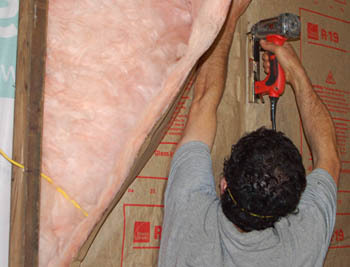 Installing insulation is reasonably simple as long as you keep a few things in mind. 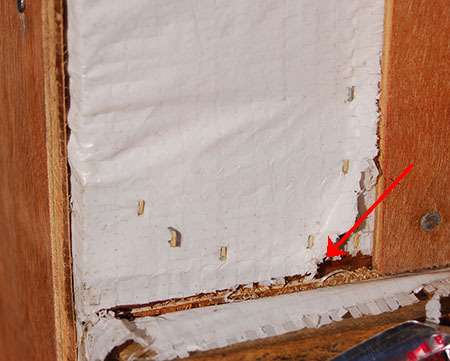 First of all the insulation has to go all the way to the edge of the stud or you'll have a gap. 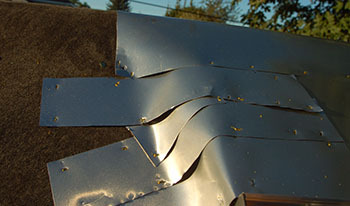 Some contractors will staple a handful of insulation to the stud itself before folding over the paper on top. 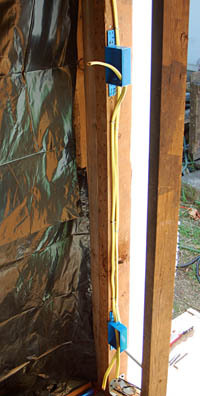 In this picture I've pulled the insulation in half and stuffed one half behind the wiring and the other half in front. 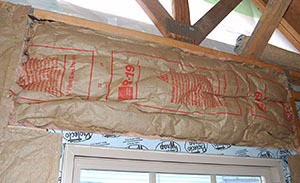 Another thing to keep in mind is that you shouldn't depend on the insulation paper to form an air seal on the inside. The paper is of very low quality and tears easily. The better option would be to use a barrier on the inside of the stud surface. There are contradicting opinions on this, and best practice can vary depending on your local climate. Here you can see an example of what not to do. Here the person installed a piece which was not fitted properly to the wall space. Unlike the rest of the pieces, this one is bunched up and poorly attached to the framing. I pulled it out, cut the insulation out of the edges, and refitted the piece in properly. 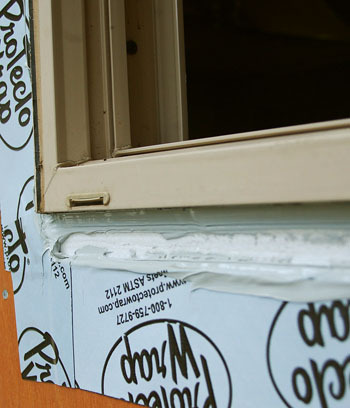 With the insulation installed, the gaps in the studs sealed, and the windows fixed it became time to focus on sealing the interior face of the walls. I spent a great deal of time deliberating how to set up the walls so that they would lose the least amount of heat. The compromise involved mylar sheets and a 3/4" air gap. 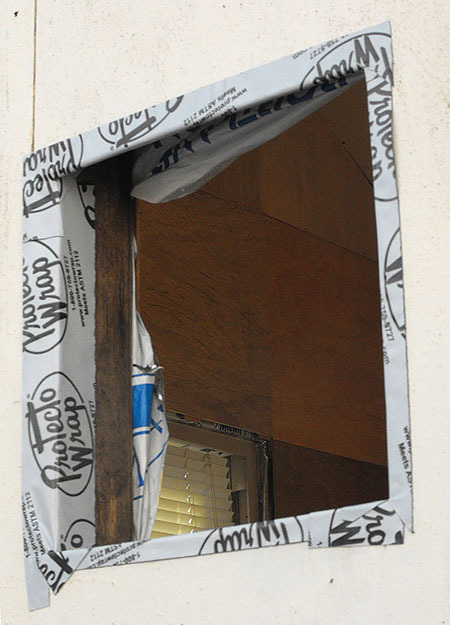 This would prevent heat from being transferred through the wall framing. In keeping with my values of (first) reduce, (second) reuse, and only then recycle. 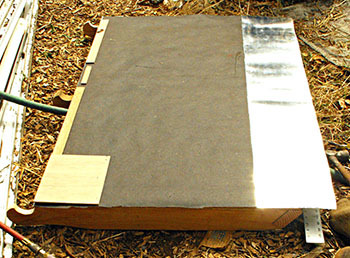 I got a most excellent idea for creating a vapour barrier using reclaimed mylar. I went to a local running event and collected mylar blankets from the participants at the end. I washed and dried dozens of these blankets on sunny days. This saved me the cost of buying sheets and prevented waste. 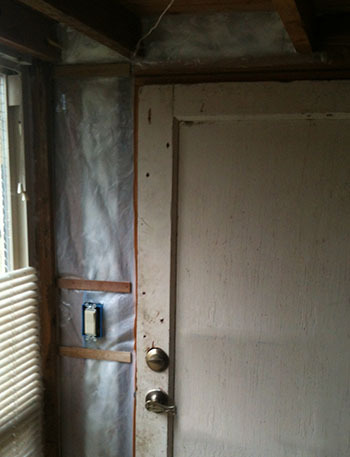 After attaching mylar sheets across the entire wall, I began tacking strips of plywood which does two things. 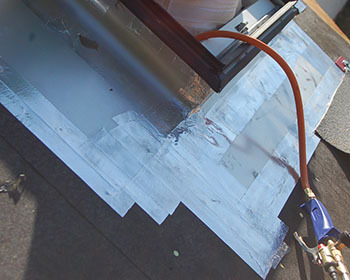 First it helps secure the mylar to the wall, and second it creates the first part of the air gap. The importance of attaching these pieces is to create a break between the mylar sheets and the finished wall. Any place that material rests directly against the sheets, it eliminates the effectiveness of the mylar. So the larger the open area, the more effective it is. 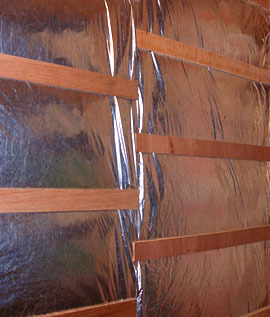 This is a view showing the wall with the mylar sheets and plywood strips holding it in place. 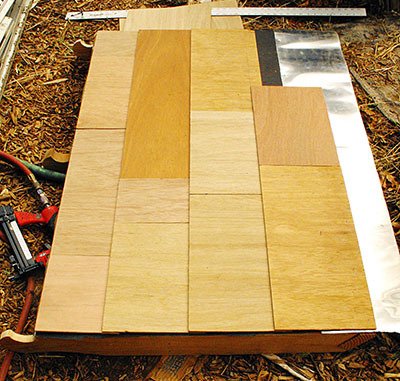 By creating a gap between the horizontal strips and the vertical strip which the finish would be applied to, heat loss was reduced even further. Here you can see each stage of the sealing process together. 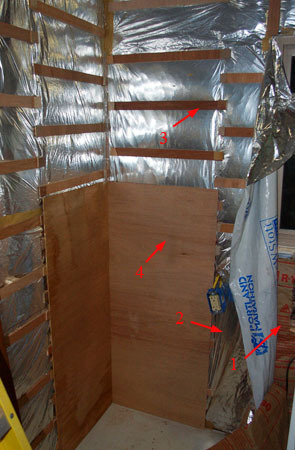 First is the insulation (1), then the mylar blankets (2), the plywood strips (3), and finally the finished wall panelling (4). 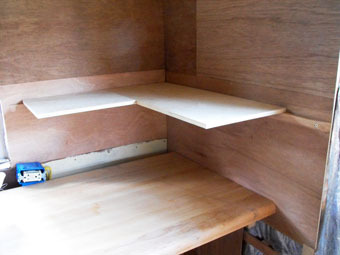 I used the poorest looking plywood in this area because the kitchen cabinets are going to cover the walls. 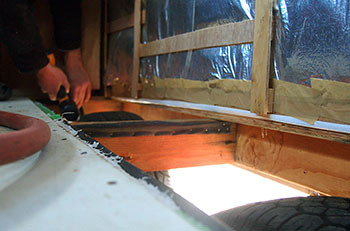 Just like with the trailer frame, I installed strips of bike tubes to the floor structure before setting the subfloor over the wheel wells. Farther along in the project, I went to a weatherization workshop and recieved a donated box of a product called 'rope caulk.' This became a much simpler way to seal gaps then regular caulk and backer rod. 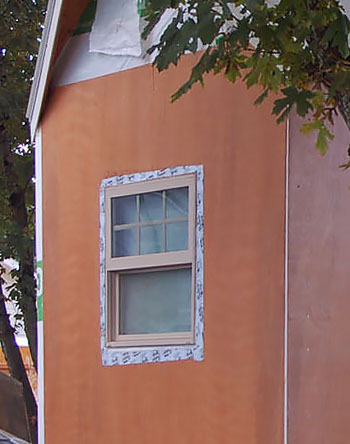 Creating a pleasant looking finish for the house was the most challenging for me. 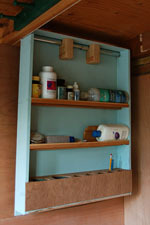 Not having the skills with finish carpentry and working with found materials I spent a great deal of time working out a way to create a nice-looking building without buying any more toxic products. I spent a great deal of time searching through the available plywood sections in order to set the nicest pieces in places where they would be visible and use the mediocre ones in areas that would be covered up. To that end, I started with the kitchen which would be largely covered by cabinets. 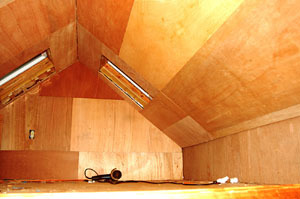 At the opposite end, here you can see the finished panelling in the bed loft. It became too problematic after a time to find enough matching pieces and I eventually succumbed to the idea of a checkerboard interior. The more important issue for me was that the space was waterproof, warm, and comfortably sized. When it came to the 4x4 columns in the south wall, I created built-up columns. 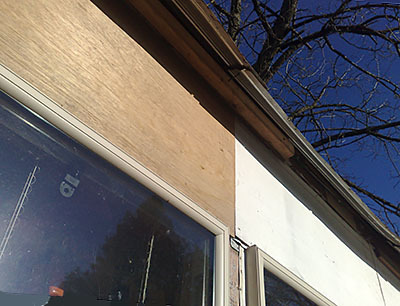 I used plywood strips to fur out the sides in order to cover the caulked edges around the windows. Once again, bicycle tubes were my friend when it came to gluing the finish material in place. One of the challenges that presented itself was that the steel rienforcing brackets were interferring with the exterior finish in some areas. This required me to lay down strips to fur out the wall 1/4" to compensate. Once the underlayer was all in the same plane, the material looked quite nice. At the same place where I was picking up the reclaimed plywood, I also found a few dozen square feet of shingles. This was quite handsome material, but there wasn't enough to do a very large section. 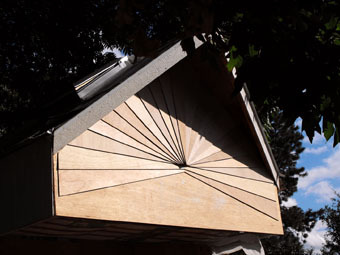 Eventually I decided to use them to fill in one of the gable triangles and the result was quite nice. I experienced the same dilemna on the front of the house. What reclaimed materials would cover it without looking like a checkerboard? Eventually I came upon the idea of a sunbeam pattern. 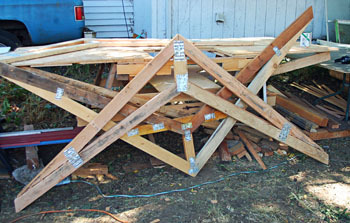 I located the center of the triangle, and built rotating wedges of plywood until the whole section was covered. Here is the finished sunbeam front. At this time I hadn't decided whether to use an oil finish or paint to protect the material. 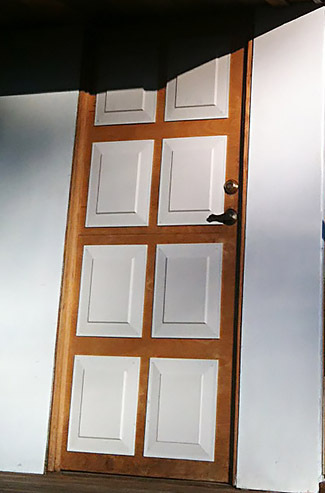 I happened to be storing some nice oak planks and found a use for them in the front door. However I made a significant mistake by not creating a proper rabbit joint between the sides and the top. This meant that there was nothing to prevent the door jamb from pressing inward. I was challenged both by inexperience, and by poor access to the right tools. Despite the shortcomings, I managed to get the frame held in place properly and continued work on the hardware. While I didn't have a router, I did have a dremmel tool, and this proved useful enough to accurately carve out the material for the hinges and latch plates. 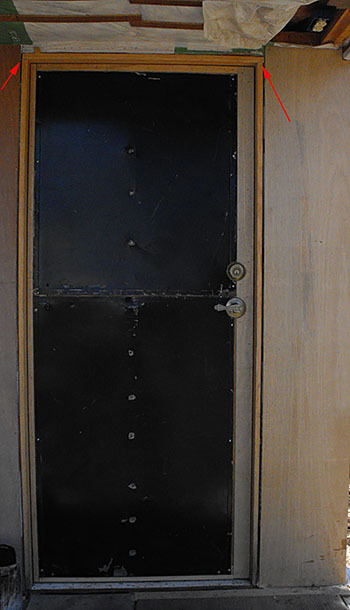 For the door itselhttp://www.towardzeroimpact.net/architecture/tiny-house.phpf, I started with a standard low-quality interior door. This had to be cut down to the 70in height of my custom opening. 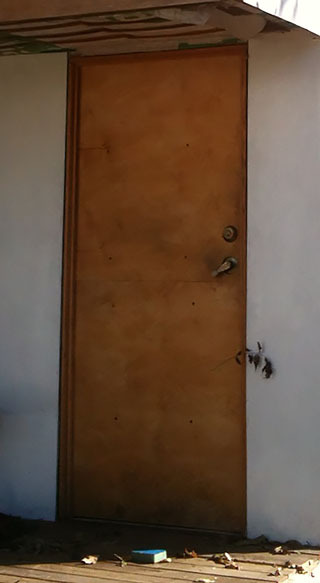 Because an interior door would not provide the level of security necessary in that neighbourhood, I attached a large piece of sheet metal to the outside of the door. Once that was finished, I used thin plywood strips to again fur out the frame and finished it off with some plywood to hide the metal. After the finish plywood was done, I oiled the surface and attached some decorative pieces to help break up the plain surface. 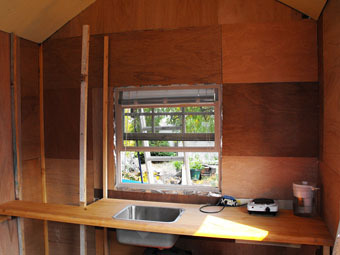 It took a lot of searching, but eventually I found enough scrap cedar to build trim for the windows and the corners. This became really key in giving the structure a more polished appearance. I found enough pieces of similar wood to install the ceiling above the porch. 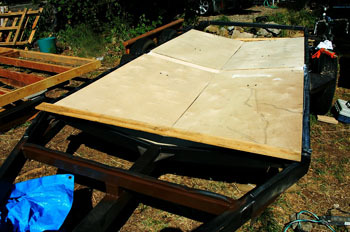 It might have been okay to use plywood, but I preferred solid wood whenever possible to ensure a more durable structure. I was lucky enough to know the right people and bought a few lengths of scrap maple from an acquaintance who owned a sawmill. He brought up a number of lengths of 2x2 material and my friend Brian helped to turn that into a solid wood counter. It was one of the most beautiful elements to the house. I left a void in the counter to leave space for the pantry framing along the left side. In retrospect that was not the wisest decision as it reduced the chance that the full counter would be re-used down the road, but for this space it worked fine. I began building the upper cabinets by installing an oak nailer and then overlapped some finish-grade plywood to create the corner cabinet. 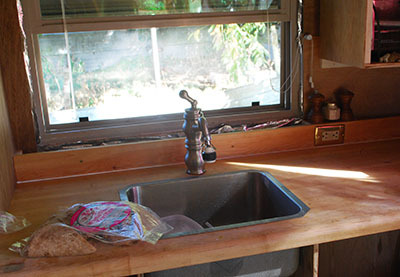 Here you can see the counter in place along with the kitchen sink and the faucet. The outlet was integrated into the backsplash and the joint sealed with a bead of caulking. If you're curious, the sink drains straight into a french drain. I use very little water and there was never a problem. Here is a shot of the kitchen with the work much farther along. I felt incredibly lucky to find the drawers on the right for free on the curb and they fit right in between the sink space and the wall. The structure above the sink was intended to drain water from the dish drying rack into the sink. That idea didn't work so well.